Not only were the 1930's in America a time of great economic strain and change, but they were also a time of hostile cultural conflict. The nation's universities saw great intellectual sparring between philosophical rationalists and empirical, scientific naturalists. The rationalist school, filled with neo-Aristotilians like Mortimer J. Adler and Robert M. Hutchins, promoted a philosophical rationalism that claimed reason can discover immutable metaphysical principles that are the foundations for the rationally true and ethically good. The scientific naturalists, like Anton Carlson and John Dewey, claimed that there were no absolute principles in the universe and that man should govern his actions with an empirical, scientific problem-solving pragmatism. This philosophical debate was not restricted to the Academy. The philosophy behind the New Deal was primarily a pragmatic one, and people who saw this approach as a departure from their accepted way of life felt anxiety at the change. What was at stake in this conflict was more than mere political power; the theory of education, the way of viewing the past, the way of respecting authority, and Americans' very theory of their own identity hinged in the balance of this intellectual and sociological debate. This conflict between two opposing philosophical camps can be seen in two novels of the 1930's, Absalom, Absalom! 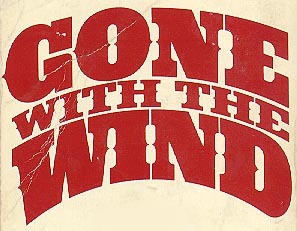 by William Faulkner and Gone With the Wind by Margaret Mitchell. In both novels characters attempt to function in a "new" world formed in the aftermath of the Civil War. In many ways the South of Reconstruction resembled all of America during the Depression, and the choices that Faulkner's and Mitchell's characters are forced to make would have resonated especially with their 1930's readers.